We would like to thank all our sponsors and partners for their continued support. If you are interested in partnering with or sponsoring the Quality Food Awards, please contact Commercial Manager Kim Reddick on 0208 253 8645 or kim.reddick@emap.com. Food and drink is Northern Ireland’s most dynamic industry and a major driver of growth in business with the Republic of Ireland and further afield. The success of the industry, contributing around £4.5 billion annually to the regional economy, is the result of the dedication of companies to innovative food and drink products that meet the requirements of individual retailers and foodservice organisations in the Republic for consistently high-quality food that combines outstanding taste with safety and provenance. Our companies, both large and small, are experienced in working with clients in the Republic, our biggest market, in the development of products for specific opportunities to the quality and volumes required. They are able to respond quickly and cost-effectively because of their flexible operations and very short and fully traceable supply chains to farmers, packaging businesses and transport providers. They operate to the highest European hygiene and safety standards such as BRC and SALSA. The quality and innovation underpinning this important industry have earned companies major awards in globally recognised events, including the Irish Food Quality Awards, Blas na hEireann Awards, the UK Great Taste Awards, the World Cheese Awards, the US Speciality Food Awards and the International Beer Challenge. Invest Northern Ireland (Invest NI) works closely with companies that are planning to invest almost €2 billion over the next five years, across a broad range of activities including product development, process innovation and international marketing. Brokering business relationships between local food and drink companies and retailers and foodservice operators in the Republic of Ireland and further afield is a strategic priority for Invest NI and is co-ordinated by a team of food development executives based in the Republic of Ireland, Great Britain and other parts of Europe and further afield. It is our pleasure to sponsor the Irish Quality Food & Drink Awards. 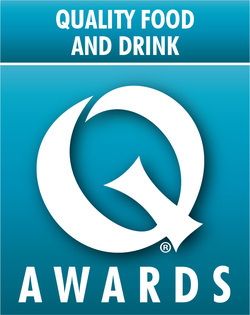 We recognise the important role of “Q” Awards in highlighting product quality and supplier professionalism and confidently look forward to benchmarking Northern Ireland produce against the best in the industry. Campden BRI provide technical, legislative and scientific support and research to the food and drinks industry worldwide. We offer a comprehensive “farm to fork” range of services covering agri-food production, analysis and testing, processing and manufacturing, safety, training and technical information services. Our members and clients benefit from industry-leading facilities for analysis, product and process development, and sensory and consumer studies, which include a specialist brewing and wine division. Contigo are Category Management and Insight Specialists. We love to unearth consumer insights and derive clear stories from data and talking to people. Passionate about category management and insight-led solutions, we have an acute understanding of the needs and expectations of manufacturing, selling and retailing food in the UK. We are down-to-earth, flexible, reliable and take pride in our work. Our not-so-secret ingredient is putting the consumer and end user at the heart of our thinking and practice. We offer fast-turnaround high-quality marketing and consumer insights at cost-effective rates on either a one-off project or retained basis. Core expertise: Consumer Insights, Research and Data Analysis Category, Brand and Project Management Retail and Shopper Behaviour Marketing and Business: Strategy and Implementation Our success lies in our ability to focus precisely on what target audiences and businesses need and want. Having lived and breathed the industry, we can draw on that experience to tailor ways of working to meet individual requirements. With an excellent track record in delivering results from strategy through to hands-on implementation, we have a reputation for building trust through long-term relationships. The Spanish word ‘Contigo’ means ‘with you’ and that’s the essence of what we’re about: working with you to achieve your business aims. Having spent 30 years in the food industry, Jane is perfectly placed to help fast track food business growth and identify new opportunities. ﻿﻿ This year saw the launch of Jane's "Grow Your Food Business' online course, allowing her to help more people in the UK and far beyond too. Jane’s incredible network of food industry contacts and specialists makes her the perfect facilitator, creating introductions and arranging collaborations between people and companies , easing the path to innovation and creativity on all their projects. Her level of knowledge makes her in demand to sit on the Board of a number of food and food related businesses, and is also reflected in her varied client base from Dragons' Den investments, to government trade offices, to international food businesses..
Stephen Minall is one of the owners of Moving Food Ltd which has a successful track record in launching new products into the major Retail Multiples within the UK and Europe. Moving Food works within innovation in food technology (long shelf life FMCG brands to chill chain expertise) helping SME’s and foodies the “idea creators” get to market. Moving Food has launched www.wowbutter.com a no nut peanut butter, to FMCG branded products for Ocado to Aldi to Holland & Barrett.Moving Food is unique in that it can ‘speak’ both Retail and Catering, as the owners /directors have worked on food brands and continue to work in both sectors. Moving Food Ltd advises or consults in areas in food production from new start up innovation in products or packaging and advices in the opportunities in sectors such as grab n go, ambient longer shelf life FMCG ranges. Moving Food takes the strain out of finding sources for production to packaging to access to buyers Moving Food’s experiences in food production offers a unique insight into the overall farm to fork issues facing manufacturers, brands and consumers. Sustainable Food and Drink – Organic, Fairtrade, Free From, local and more.. Increasingly we seek food and drink that is: Good for our health Good for the planet Produced naturally So how should your business respond to these challenges? Should you convert to organic, go Fairtrade, explore Free From or start sourcing locally? Could you be part of the Slow Food movement or is raw food the way forward for you? Is being all-natural enough for your business? Simon Wright of OF+ Consulting works with manufacturers, brand-holders and retailers to help them answer these questions and develop and market products that meet contemporary concerns. Through the OF+ Consulting website you can get a feel for where the sustainable food sector has come from, where it is now and where it is going. At the University of West London (UWL) we aim to inspire students to become creative professionals and connect them to exciting and rewarding careers. The University has one of the best employment rates in the country with 96% of students in work within six months of graduating. Based in the heart of one of the UK’s most successful business regions, the University has a range of highly qualiﬁed staff, with a wealth of experience in their respective disciplines, and strong connections with key industries. The University has invested over £50 million in a new environmentally sustainable campus in Ealing, delivering our vision to improve students’ learning and social experience. Our West London campus is located in what is widely regarded as being one of the most desirable places in London to live, combining a vibrant, cosmopolitan atmosphere with spacious parks and relaxed cafe culture.